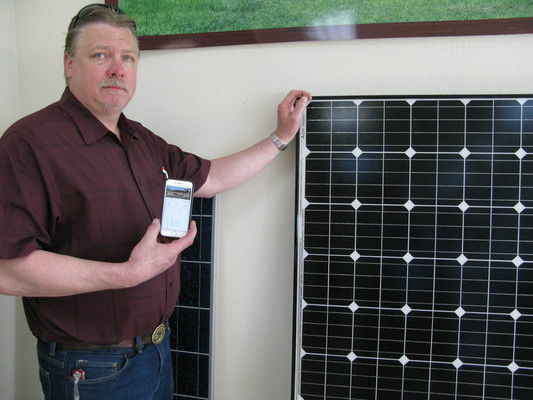 Wayne Eash finds himself doing as many solar power installations per month now as he did in a whole year when he first started. Eash is president of Photon Electric of Millersburg, which formed in 2014 with the merger of two other companies – though his experience goes back about 10 years. He said the company installs 12 to 15 solar power systems a month, which is as many as he used to do in a year when he started "from scratch." "In the first five years ... we had a 10-time increase in sales, then three-times and two-times," he said, attributing the growth largely to the spread of positive word-of-mouth. "Right now it's not doubling, but I'd say we have a 50 percent increase in sales every year." He also added about 12 employees in the last four years, who are now among the 2,700 people statewide whose jobs are directly tied to solar power. The state saw a 72 percent increase between 2015 and 2016 alone, adding about 1,130 solar industry workers, according to the advocacy group The Solar Foundation. That puts Indiana at 28th in the nation for solar jobs and 30th for solar jobs per capita. It's a higher rate of growth in that time than Illinois, Ohio and Michigan, though Indiana's total number of solar jobs remains lower. The industry's growth comes even as the Indiana Legislature moves to cut utility credits for wind and solar power. Senate Bill 309, awaiting a decision by Gov. Eric Holcomb, would revamp the state's net metering policy, lowering by 75 percent the rate customers are paid for pumping excess power generated by their solar devices into the grid. Brian Burkholder, president of Solar Energy Systems in Nappanee, another solar power installer, has been to Indianapolis to speak against the bill. He said it would not only discourage the adoption of solar power by lengthening the amount of time it takes to recoup the initial purchase price, it could also raise food prices by hurting farmers who grow using solar. Burkholder also fears it could signal a return to fossil fuels, which he said are responsible for health problems for southern Indiana residents. "The bill is not anti-solar but pro-coal, pro-pollution," Burkholder said. "If it goes through, we'll have all kinds of pollution problems. I see it as a one-sided conversation. It's all about the utilities and nothing about the installer or customer. There's no true benefit at all." Under the current net metering rate, Eash estimated that a solar installation tied into the power grid will pay for itself after 16 to 18 years. An off-the-grid solar system, typically used to replace or supplement gas-powered generators, pays for itself in fuel savings in three to six years, he said. But Eash noted the initial cost is enough to turn some people away. "Once they hear the price, some people say, 'Woah, we'll stay on the grid after all,'" Eash said. "Some decide it's easier to pay a fuel bill than to get a loan for $40,000 or $50,000." He added that installing enough solar cells to power a large operation like a big chicken barn can cost as much as $150,000. He's only seen one of those in Elkhart County. But Burkholder reasons that if you can afford a car, you can afford solar power. "From an investment standpoint, nothing beats solar in payback," he said. "There are no ongoing costs after installation." About 1,000 properties in unincorporated areas of Elkhart County currently have solar installations, estimated Chris Godlewski, director of county planning and development. He said a lot of that activity has occurred in the past 10 years. Another 28 to 30 permits have been issued for solar installations in Goshen, many since 2011. Nappanee has issued about five in the last five years, said Don Lehman with the city zoning department, including a 68.6-kilowatt system at McCormick Motors finished in 2016. He said most installations near town are just far enough outside the limits that they're permitted by the county instead. Goshen and Nappanee are both trying to make it easier to install solar power arrays by meeting the guidelines of the SolSmart program, which is funded by the U.S. Department of Energy and awards gold, silver or bronze certifications. Nappanee Mayor Phil Jenkins said it would build on the community's interest in using alternative energy to reduce utility bills and potentially provide backup power. "We believe the SolSmart program will ultimately make solar more affordable and accessible while strengthening local economic development and attracting solar developers to the region," he said in a statement announcing the effort in February. "Designation will reduce uncertainty for residents and businesses and signal to the solar market that Nappanee is 'open for business.'" The process includes updating definitions for solar power systems in city code, which Lehman said were a little out of date. "When it was written, solar was the farthest thing from anybody's mind," he said. "We're also taking roof mounts and ground mounts and looking at the difference between them. We want them permitted and inspected so they can be installed safely." Preparations also focus on safety by training firefighters to respond to a photovoltaic system fires and training inspectors on building and electrical codes for solar installations, said Leah Thill, an adviser working with Goshen, Nappanee and South Bend city officials on their SolSmart preparations. She expects them to be ready to apply soon. "Because Goshen and Nappanee are small communities, their permitting and inspection progress is generally faster and more efficient than larger cities," she said. "I expect Goshen and Nappanee will be ready to apply for designation within a month." Thill said installers throughout Indiana are seeing an uptick in requests from residents, businesses and public K-12 schools because of deadlines in SB 309. Systems installed before Dec. 31, 2017, would still get 30 years of net metering under the current rate. If SB 309 is signed into law, people who install solar systems by 2022 will have a 15-year grace period. After 2022, new net metering customers will only receive the lower rate. Advocates also point to lower costs and greater efficiency in encouraging customers to consider solar. Thill said the price has declined 40 percent in the past five years, while Burkholder said solar panels produce more power per square foot and inverters, which convert direct current power from the cells into useable alternating current power, have reached 99.5 percent efficiency. Godlewski isn't sure how much the potential loss in net metering is discouraging people from considering solar power. He noted the county recently heard two requests to allow solar arrays to be built, one in Jackson Township south of Goshen and one in Union Township northeast of Nappanee. The county Board of Zoning Appeals heard Thursday that the 304 ground-mounted solar panels proposed for Brookins Farms in Jackson Township would offset their energy costs, while the Union Township property was "the perfect spot" for another ground array. The board approved both requests. "Even with that discussion, we still have the two variance requests," Godlewski observed. "It's not stopping these two people."